Scent Description and Notes: “Radiant Chinese peony blossoms are blended with notes of lush Bulgarian rose, May rose and sensual musks. 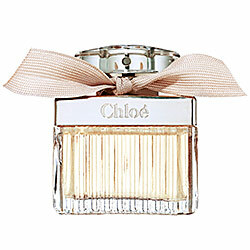 A deliciously sparkling fragrance. Bottle Design and Artwork: This is a standard imp size with a black top and tester stick. The label features The name of the scent in bold situated horizontally across the front of the imp. Below that is the non-bolded phrase “perfume oil.” The back of the label features two Deco iris while the front of the label displays the name of the company, the website in smaller font, and an image of an Art Deco woman on what looks like a lily pad. ITI: I was anticipating rose being the foremost note, but instead, peony blossoms unfurl, revealing a lovely, sweet Bulgarian rose note in the center of the scent, while languid musk lingers along the bottom elements of the scent. Wet: The rose and peony vie for attention, yet there is a lovely dewiness about the floral notes that gives the scent a delicateness that I really appreciate. The musk once again emerges after a minute, but it’s gentle and subdued under the elegant floral notes. Dry: I’m honestly surprised by the longevity of this scent. Nearly 18 hours from application, I can still detect rose, peony, and musk. While the intensity is much reduced, the quality of each note is discernible and detectable enough to have a 1″ throw even now. Scent Description and Notes: “Miss Jennie Creagh, a dashing brunette, has splendidly furnished her palace at 17 Amity street, from top to bottom, sparing neither expence nor labor to render it a palace of beauty forever, with it’s French mirrors, English and Brussels carpets, rosewood furniture, superb bedding and everything in character. This emporium of love and beauty is one of the finest in the city. Oil Color: Clear and colorless. Bottle Design and Artwork: This is a standard vial / imp size (1/32 oz). This is a decant from Absinthetics. On the back, she has the notes of the scent, the title of the scent in orange, the company acronym in bold, and her decanting information. The image is of a 19th century lady looking forward, adorned in frills coming from her high-necked dress and in copious amounts on her hat. ITI: It’s sweet and floral, like a Sunday mimosa sitting on the garden veranda. Wet: It’s light, innocent, and airy. The peach is certainly ripe, and it’s framed beautifully by the peony and the carnation. The freesia sits behind the other notes adding a little soapiness, but mostly tamed by the amber. Dry: I’m surprised that such a light scent would still be detectable after 12 hours, but I can still make out the peach and the peony.